Journalists and photographers battled the wind near the entrance of the Svalbard Global Seed Vault in the Arctic. WASHINGTON — Tucked in a mountain on a remote Arctic island, beneath several hundred feet of rock and a near-constant blanket of snow, two imposing steel doors lock out the wind and bitter cold. Behind them, a long tunnel leads to a series of quiet, concrete rooms. Austere fluorescent bulbs illuminate thousands of black boxes crowded upon row after row of shelves, each box packed to the brim with dozens of heat-sealed silver packets. In each packet is a handful of sleeping seeds — the last-resort guarantors of the future of our food. The Svalbard Global Seed Vault opened in 2008 as a ‘‘backstop’’ for seed banks around the world, in case their own archives of agricultural heritage are threatened by disaster. Isolated by miles of sea and acres of forbidding ice from the specter of earthquakes, heat waves, and human menace, the vault and its contents will last 1,000 years. It’s a sort of Noah’s Ark for plants, built to withstand the events (wars, crop-disease, climate change, asteroid impacts) that might wipe a species from the rest of the planet. 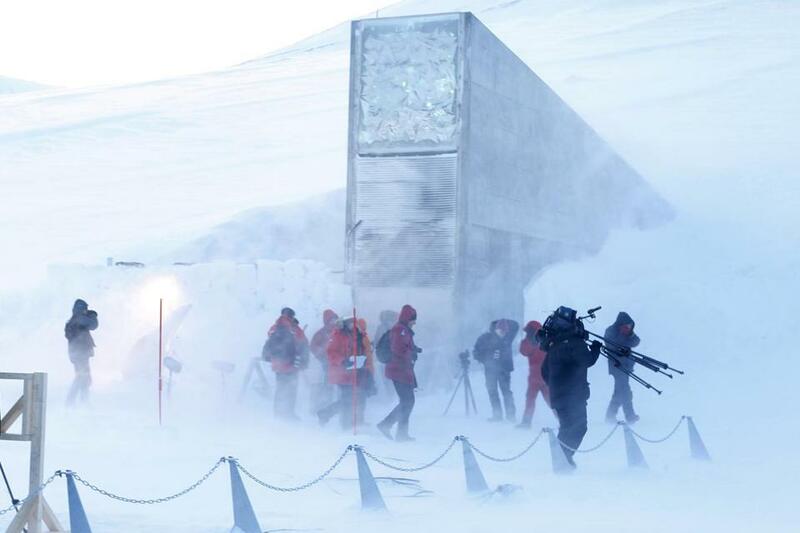 But just seven years after the vault’s steel doors first opened, admitting contributions from seed banks around the world into the frozen sanctuary, 130 of the boxes are being recalled. They belong to the International Center for Agricultural Research in the Dry Areas (or ICARDA), which until two years ago stored thousands of seeds in a vault in Aleppo, Syria, according to Reuters. The ICARDA center, like so many other important institutions in the civil war-ravaged nation, was displaced by the conflict, and, in the process, 325 boxes of duplicate seeds were sent to Svalbard for safekeeping. Now resettled in Beirut, the organization wants some of its samples back. Though often described as a ‘‘doomsday’’ vault, a bulwark of biodiversity to protect global famine, the Svalbard bank was actually made for this kind of smaller withdrawal. In fact, the former Global Crop Diversity Trust executive director Cary Fowler, who now serves as a senior adviser helping care for the vault, bristled at the ‘‘doomsday’’ description. It seems humanity is perfectly capable of destroying its agricultural heritage — and possibly its future — using entirely conventional means. The notion of storing and preserving seeds is hardly new. Arguably, it dates back to the beginnings of agriculture itself, in the ‘‘Fertile Crescent’’ that arced across much of the Middle East, including Syria. By saving some seeds each harvest, farmers were able to guarantee next year’s crops. According to the New Yorker, these seeds were guarded vigilantly — packed into baskets full of ash and buried underground, sealed in adobe containers and stored in thatched huts. If a community’s seeds didn’t make it through the year, the community itself likely wouldn’t make it either. The next 10,000 or so years of careful cultivation gave rise to a vast array of domesticated plants; there are more than 250,000 species of edible plant, according to the UN’s Food and Agriculture Organization (FAO), each represented by dozens, sometimes hundreds or even thousands of varieties. One hundred years ago, for example, there were more than 7,000 kinds of apple grown in the US — ‘‘Arkansas Beauties’’ that melted in your mouth and the tender, juicy ‘‘Massachusetts Magnolia.’’ But now, according to a TED Talk given by Fowler, all but 300 are extinct. Those that vanished are kept alive only in the genetic material carried by the tiny seeds inside banks like the one in Svalbard. Loss of biodiversity has become a worldwide trend, as farmers abandon a wealth of varieties for the ones they know will work. Why bother growing a blush-colored ‘‘Tenderskin,’’ which is really only great in pie, when millions of bushels of all-purpose red delicious sell every year? The FAO estimates that 75 percent of plant genetic diversity has been lost in the past century, and notes that three species — wheat, rice, and corn — account for nearly two thirds of all calories consumed today. This fact makes us incredibly vulnerable, the FAO, Fowler, and others argue. If farmers are only growing a few types of apples, what’s to be done if a crop disease comes through and wipes them all out? Even more frightening, what if the same thing happened to rice, or wheat? That’s more than just a hypothetical scenario. Plant pathologist researchers are currently ferociously investigating a wheat rust known as Ug99, which arose in Uganda more than a decade ago and has destroyed countless acres of crops in Africa and the Middle East. According to The Scientist, about 90 percent of the world’s wheat varieties are vulnerable to the rust.